Here is an how-to get an immune system boost using excellent immune system supplements, foods and activities to boost the immune system. The human body’s immune system works to keep you well. There are simple activities you can do, take wonderful immune system supplements, eat certain foods to give yourself the immune system boost you need to help you stay well and help your body fight and conquer disease. The main components of the immune system are found in your blood, lymph nodes, spleen and thymus. Here white blood cells actively seek out, identify and destroy invading pathogens such as viruses, bacteria and any other disease containing entity that seeks to harm its host—YOU! There are special cells of the immune system and they are very specialized in their tasks. This brief description is that they are able to identify a “bad” cell and then be able to destroy it before it hurts you. Your body is very busy as you go about your daily activities, eat and sleep. 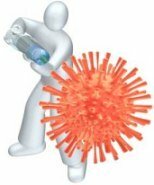 Your immune system will do its job, but you have the responsibility to help it. When YOU do not take care of your immune system, it will malfunction and you will get ill from bacteria, viruses or even a “bad” cell multiplying unchecked. Being ill is a sure sign that your immune system is not working correctly. Here are a few suggestions on how get this all important immune system boost. Although some of the following suggestions may come under the umbrella of general health and common sense, the reason why they are repeated here is simply because in so doing you will be taking care of your body, in particular, your human body’s immune system! Take time to rest and get enough sleep. We live in a fast paced, extremely busy and stressed society. Many people are also very stressed AND sick! There may be a connection. Stress is bad for your health─ and your immune system! Make it a point to un-stress yourself. For the sake of your immune system, make it a point to rid your life of as many negative and stressful things as you possibly can. You will feel better and your immune system will benefit. You do remember that some of the components of the immune system are the white blood cells found in your lymph nodes and blood. Your blood circulates throughout your body because your heart pumps it. However, your lymph system, which is similar to your blood system, is different in that it had no organ to circulate the healing properties of the lymph fluid and white blood cells. Therefore, it depends on YOU to exercise. Arthritis Today totes the benefits of walking—outside!The simple activity of taking a brisk walk outside in the sunshine has many immune system boosting activities. The full spectrum sunlight has properties that your body craves. Exercising moves the lymph fluid and the related immune system components throughout your body and deeply breathing in fresh air clears your lungs and even your thoughts to make them more positive! There are certain foods that help to give an immune system boost including immune system supplements. Healthful foods have always connected to good general health. Good nutrition will give the necessary vitamins to help the immune system in particular and your whole body will benefit. Whole foods and fresh foods, foods in their natural state, produced with as few chemicals as possible (organic) are considered healthy foods. Eating a wide variety of these foods, “eating a rainbow” of foods, is touted as being the healthiest diet, helping all parts of your body and perhaps giving your immune system the least work! Of all of the good foods available for you, some show remarkable immune system boosting properties. Perhaps the best food for the human body’s immune system is garlic. Although garlic may be one of the most remarkable foods to boost the immune system, there are others. Although not considered as “food” in the traditional sense, immune system supplements are also very effective in strengthening the human body immune system. Learn to eat more alkaline foods. Your body's pH is a good indicator of your overall wellness. Knowing the answer to the question "What does pH stand for?" will help you to both obtain and enjoy better wellness. Maintaining a neutral to a bit alkaline pH will significantly give you an immune system boost. Two immune system supplements that I have found both personally, and in talking to those who take them faithfully, are colloidal silver and glyconutrients. Metals are NOT food! However, the cells and organs of the human body’s immune system seem to really like and reward the use of trace amounts of silver. The danger, and there is a very real potential problem with some types of colloidal silver, is that overuse results in a non-fatal but annoying and permanent condition that turns your skin blue called argyria. Using silver correctly may benefit your health and strengthen your immune system without any colored sided effects. As with ANY type of supplement that claims to benefit your health, do your research first! Glyconutrients seem to be the “new kids on the nutrition block.” Although this is a relatively new branch of science, it has much promise especially in supporting the components of the human body’s immune system. There are eight glyconutrients recognized as specific plant molecules called saccharides. In the 1996 issue of "Harper's Biochemistry"; a medical textbook, Dr. Robert Murray identified the eight glyconutrients necessary for human health. Research is showing that some herbs and plants traditionally prized in some cultures for their remarkable healing properties such as the herb Echinacea, Aloe Vera, and various species of mushrooms, among many others, are actually very high in glyconutrients. These eight glyconutrients support the immune system by aiding cellular communication. You already know that immune system cells need to identify a bad cell and then kill it. If the immune system cells cannot recognize an evil cell, the pathogen will grow unchecked, harming the body. On the other hand, if the immune system cell mistakenly identifies a good cell as a dangerous pathogen and kills it, then your immune system is attacking good cells and tissues and destroying your body. Rice-E - This is a powerful blend of over 100 antioxidants! If you want an immune system boost in a bottle--look no farther. Along with its antioxidants, it has many live vitamins ready to nourish you! Camu-C - This is another superior product that supports your immune system by providing superior antioxidants, live vitamins and plant derived minerals. This product has the fringe benefits of tasting yummy too! Immune system supplements are important to your overall health. Add to them a lifestyle that includes eating foods that give an immune system boost, enough healing sleep and a minimum of stress and you will be on the right track to a more health-filled future. For more information on How to Boost YOUR Immune System --just follow the link.